Case 1 was that of a 2 cm nodule fortuitously discovered by ultrasonography in the pancreatic tail of a 66-year-old man. The patient’s CA 19-9, CEA and Chromogranine A levels were all normal. Endoscopic ultrasonography confirmed the presence of the nodule in the pancreatic tail, but transgastric, fine-needle aspiration of the lesion could not establish a diagnosis. Case 2 was that of a 42-year-old woman with a history of multiple endocrine neoplasia type 1 syndrome (with heterozygous mutation of exon 10 on the MENIN gene), who was referred for long-lasting symptomatic hypoglycemia. A fasting test failed to reveal concomitant elevated values of serum insulin or C-peptide. 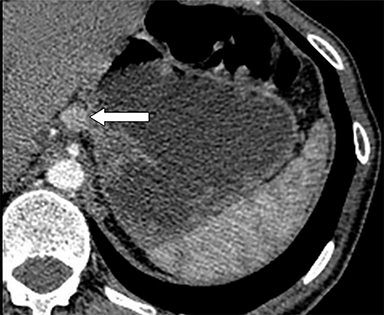 With regard to the first case, computed tomography (CT) confirmed the presence of a 25 x 20 mm intrapancreatic nodule (Figure 1A, arrow). 111In octreotide scintigraphy showed increased uptake of the nodule (Figure 1B, arrow). 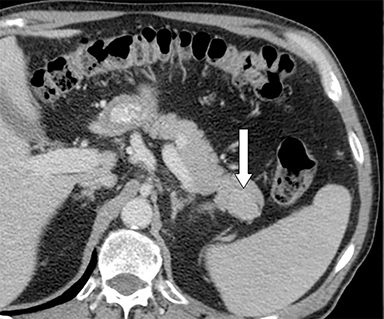 With regard to the second case, CT revealed 2 small nodules, one adjacent to the pancreatic tail (Figure 2A, arrow) and another in contact with the pancreatic body, anterior to the celiac artery (Figure 2B, arrow). 111In octreotide scintigraphy showed focal increased uptake only by the pancreatic body lesion (Figures 2C and 2D, arrow). Both patients underwent surgery for suspected neuroendocrine tumors, the first for a suspected non-secreting neuroendocrine tumor and the second for a suspected insulinoma of the pancreatic body. In patient 1, the presence of a nodule in the pancreatic tail was confirmed at laparotomy. Thus, a left pancreatectomy with spleen preservation was performed. Macroscopic examination of the specimen revealed a 2.0 x 1.5 cm well-delimited, intrapancreatic lesion. Histological analysis concluded that the lesion was an intrapancreatic accessory spleen. No pancreatic neuroendocrine tumor was found in the specimen. 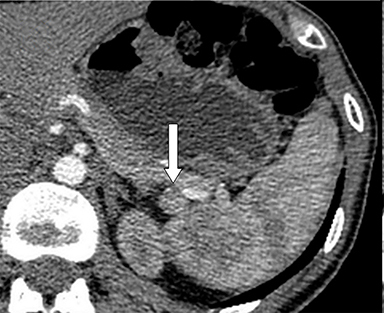 In patient 2, two small nodules juxtaposed to the upper margin of the pancreas were enucleated. Macroscopic evaluation revealed 1.4 × 1.5 × 1.0 cm and 1.2 × 1.0 × 1.0 cm well-delineated nodules. Frozen-section examination was positive for neuroendocrine tumors. Later immunohistochemical stainings showed expression of synaptophysin and chromogranine A, but these were negative for insulin and positive for glucagon. 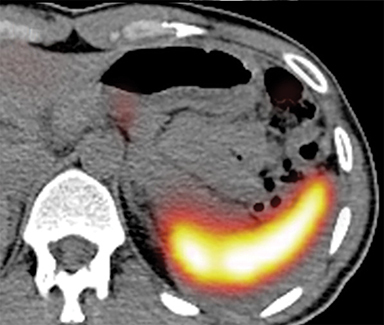 Postoperative persistence of hypoglycemia led to the realization of 68Ga-DOTATOC positron emission tomography (PET), which revealed focal increased uptake of the lesion in the pancreatic tail. 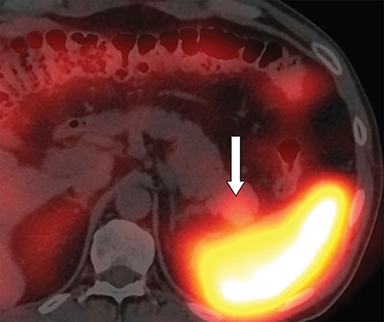 99mTc-labeled denatured erythrocytes single photon emission computed tomography ruled out the diagnosis of accessory spleen. Patient 2 underwent a second surgery for a left pancreatectomy with spleen preservation. The nodule was determined to be an insulinoma on histological analysis. Three additional glucagonomas with sizes ranging from 0.7 to 1.0 cm were found in the specimen. Postoperative course was favorable with definitive remission of hypoglycemia. The CT results, put in conjunction with the positive 111In octreotide scintigraphy, raised a high level of suspicion for neuroendocrine tumors in both patients. However, definitive diagnoses were surprisingly different, with one false-positive lesion in patient 1, and one missed lesion in patient 2. It’s worth noting that many other tissues or conditions, such as the lymphoid tissue of the spleen, can express high densities of somatostatin receptors and lead to false-positive results,1,2 as illustrated by patient 1. Similarly, the sensitivity of 111In octreotide scintigraphy is highly dependent on the histological subtype of the tumor, ranging from 46% for insulinomas to 100% for glucagonomas,3 causing false-negatives to occur in a significant proportion, especially in MEN-1 patients who present numerous lesions.4-6 In view of these considerations, the initial diagnosis of an accessory spleen in the pancreatic tail could therefore have been ruled out in patient 2, and the presence of a neuroendocrine tumor considered. Extensive preoperative investigations of pancreatic neuroendocrine tumors do not necessarily yield an accurate diagnosis. It should be mandatory to have an extensive knowledge of conditions possibly leading to false-positive and false-negative results and to put 111In octreotide scintigraphy results in conjunction with clinical context and other imaging modalities. Lebtahi, R, Cadiot G, Marmuse JP, et al. 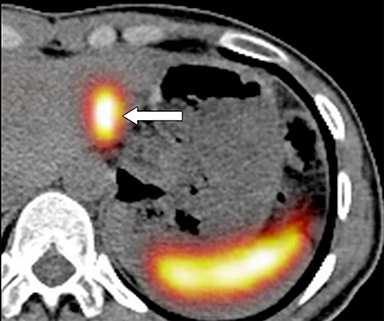 False-positive somatostatin receptor scintigraphy due to an accessory spleen. J Nucl Med. 1997;38: 1979-1981. Gibril, F, Reynolds JC, Chen CC, et al. Specificity of somatostatin receptor scintigraphy: A prospective study and effects of false-positive localizations on management in patients with gastrinomas. J Nucl Med.1999;40:539-553. Krenning, EP, Kwekkeboom DJ, Oei HY, et al. Somatostatin-receptor scintigraphy in gastroenteropancreatic tumors. An overview of European results. Ann N Y Acad Sci. 1994;733:416-424. Le Bodic, MF, Heymann MF, Lecomte M, et al. Immunohistochemical study of 100 pancreatic tumors in 28 patients with multiple endocrine neoplasia, type I. Am J Surg Pathol. 1996;20:1378-1384. Grama, D, Skogseid B, Wilander E, et al, Pancreatic tumors in multiple endocrine neoplasia type 1: Clinical presentation and surgical treatment. World J Surg. 1992;16:611-618; discussion 618-619. Cougard, P, Goudet P, Peix JL, et al. Insulinomas in multiple endocrine neoplasia type 1. Report of a series of 44 cases by the multiple endocrine neoplasia study group. Ann Chir. 2000;125:118-123. Radiological Case: Intrapancreatic accessory spleen; pancreatic glucagonoma. Appl Radiol. Prepared by Dr. Meyer, Dr. Thomopoulos, Prof. Mentha and Prof. Berney while practicing in the Division of Visceral and Transplantation Surgery, and Dr. Terraz while practicing in the Division of Radiology, at University Hospitals of Geneva, Geneva, Switzerland.